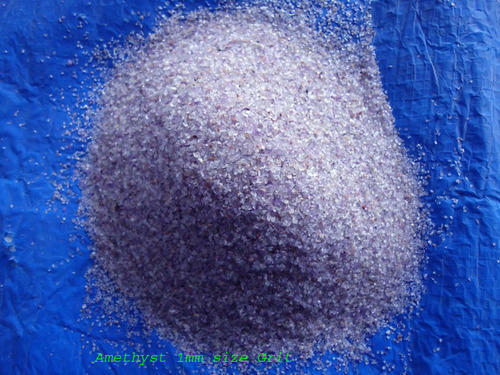 We are largest manufacture, exporter and supplier of Indian 150 Mesh Amethyst Powder in our company at India. We are based in Bhuj, Gujarat, India. We are providing minerals based on research and sales on mineral products. We are dealing in amethyst and rose quartz powder that is made by superior quality with required fine mesh size. These are according to the client demand. We export our amethyst and rose quartz powder now many countries. Our company is supply amethyst and rose quartz powder in global market past 12 years. We offer our amethyst and rose quartz powder in bulk quantity without quality compromised with our products can be high purity, durable, super-fine, and have a good competitive cheap FOB price. We are involved in offering a wide range of amethyst and rose quartz powder to our most valued clients. Our range of amethyst and rose quartz powder is widely appreciated by our clients who are situated all-round the nation. We offer our range of product at most affordable prices. Our available packing size: 50kg bags / 20 bags in 1 MT. Our Quality: Our amethyst and rose quartz powder is high purity, durable, super-fine, and good competitive cheap FOB price. Application:1 cosmetic manufacture industries etc. Founded in the year 1987, miracle marble art is one of the country premier manufacturer and exporter of agate polished pebble, tumbled pebble, river pebble, agate stone rough lumps, agate stone polished chips, aquarium gravel, ceramic grade china clay lumps & powder, terrazzo chips, aquarium rocks, aquarium sand,marble chips, granite sand, aggregate, gemstone sink, semi precious slabs, we are india leading brand name in agate polished natural pebbles and natural stones. Backed by an industry experience of about 18 years, the company today has come to occupy an indomitable presence in its sphere of operations. The company ascribes this tremendous success to the quality & variety of its products, as well as to the dedication and commitment of its team of talented artisans, designers and management. We are committed to creating and providing top-notch quality natural stone products at affordable prices along with excellent services to our valued customers. Since 1997, the company has been at the forefront in India in the development of new products and applications for decorative pebbles. Our export markets have developed in a number of countries over the past 9 years. A recent addition to our agate polished pebbles and natural stone range is natures stone. These are all sourced within India.